The College is making changes to its graduate business program to ensure that it is meeting the evolving needs of the business community. 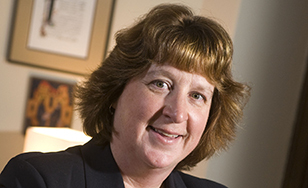 St. Scholastica's Master of Business Administration (MBA) program is now focusing on leadership and change management, said Lynne Hamre, dean of the School of Business and Technology. "In this knowledge economy, organizations say they need people who can adapt, think strategically and lead change," Hamre said. "We're leveraging the strengths of our faculty, and offering a different value proposition than a traditional MBA." Classes for the new MBA will start in September. St. Scholastica's MBA program is characterized by its flexibility. Classes are offered at three campus locations: Duluth, St. Paul and St. Cloud. Classes are held in the evening to help working adults meet their educational goals. Full- and part-time options are available, and students can complete the program in as few as 12 months. Minneapolis/St. Paul Business Journal ranks St. Scholastica's MBA program as one of the top 10 in Minnesota by enrollment size. The College experienced the highest rate of enrollment increase of any of the other top 10 MBA programs. The School of Business and Technology at St. Scholastica also offers a master of arts in information technology leadership, a master of science in project management and an online MBA in Rural Healthcare. St. Scholastica is also teaching management students at both undergraduate and graduate levels about the cutting-edge Socio-Economic Approach to Management (SEAM), a 40-year-old change intervention philosophy that has gained influence in Europe but is just getting started in the United States. With a focus on eliminating "hidden costs" by putting the employee experience first, SEAM complements the College's mission and values. "It places a high value on meaningful work for an individual, and that aligns nicely with the College's Catholic Benedictine values," Hamre said. The SBT will host a SEAM conference featuring Henri Savall, the originator of the SEAM theory, April 28-29 on campus. For more information, visit www3.css.edu/sbt/seam. To learn more about the new MBA program or to register, visit mba.css.edu.